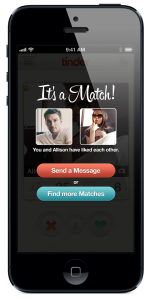 Tinder is a datingapp where you can get easily in touch with people around you. You do not need to create a detailed profile because you use your Facebook profile. If you are in the app you see people and you can indicate whether you like someone. If that person also indicates this with you then there is a match. You can start chatting with each other to know each other better.